Two men who played starring roles in their respective team’s wins last weekend cannot wait for tomorrow’s crucial derby encounter when Heriot’s welcome Watsonians to Goldenacre. The Myreside outfit travel across the Capital for the CSL Eastern Premiership clash sitting top of the table with five matches remaining. Eight days ago they won at Falkland by 147 runs after bowling out the hosts for 36. 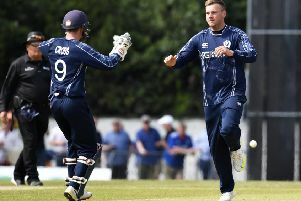 In that match Andy McKay took five wickets to put his league total for the summer at 31, but 19-year-old Ally Sadler claimed 3-12 and has been in good form of late. The left-arm seamer has 12 league scalps to his name in 2016 and is enjoying his cricket. Sadler said: “I was away in South Africa over the winter and getting to play cricket out there was a great experience. The trip taught me a lot about myself as a bowler and I feel I came back to Edinburgh a more confident player. When Watsonians faced Heriot’s earlier in the season they won a low scoring affair by three wickets. Sadler took four wickets in that one at the end of May and believes his side are focused ahead of the return fixture. Sadler may be at the beginning of his senior cricket career, but Kevin McLaren of Heriot’s has been involved for a number of years. The 35-year-old is now in his second stint at the club having also played for Penicuik, Greenock, RH Corstorphine and Dunfermline as well as earning Scotland ‘A’ caps. Last weekend the left-handed batsman top scored with 86 to help his side to a victory over Stoneywood-Dyce. It left them fifth in the table with eight wins to date – and they are keen to put a dent in Watsonians’ title hopes. “I am enjoying my cricket more than I ever have at the minute because we have a bunch of boys who are working hard for each other and we have really come on leaps and bounds this year,” McLaren said. “We struggled a bit at times last summer, but the younger players like Mark Watt and Ryan Brown have come on and Keith Morton is a more confident skipper now. “Hayes van der Berg and Adrian Neill have been great additions too and while they have scored a lot of runs and taken a lot of wickets everyone has chipped in and played their part. Watsonians have Olly Brown coming into their team while Watt leads Heriot’s with Morton on holiday. Elsewhere in the top flight tomorrow, second placed Carlton will be looking to keep their title chase going at Falkland while fourth placed Mazars Grange host winless Stoneywood-Dyce. Baillie Gifford ESCA Championship leaders SMRH are on the road to Stuart&Stuart Penicuik.